Quick Takeaway: The book’s subtitle sums this book up brilliantly: “A Novel of Redemption.” Don’t be dissuaded by the dark title. This is ultimately a very uplifting book. 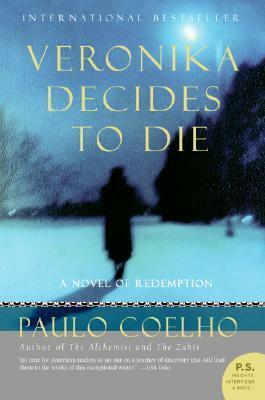 Review: Veronika, a young woman who thinks she has nothing to live for, attempts but fails at suicide. As she recovers in a mental hospital, she learns that her suicide attempt has done damage to her heart and she has very little time to live. But her time in the hospital helps her to regain the joy of living and the freedom of being herself. This book has many very sad moments, but it has a very triumphant feel. The life lessons that Veronika learns during her stay in the mental hospital are very universally valuable. There are some very profound moments here. I’ve actually read this book several times. Whenever I’m feeling like I’m in a rut, or when I feel like I’m not experiencing all the joys that life has to offer, I reread this book in order to be reminded of the importance of being myself and never giving up on the beauty that can be found in the most unlikely places. Final Thoughts: This is a very powerful book. I think that it has many timeless qualities, and it expertly delves into many aspects of the human condition. I bought a copy on Amazon, but I know my local public library also has a copy! I have not seen the film because I loved the book so much and I was worried that it might not live up to the book’s greatness!